A Nobel prize medal. The Nobel prize in economics was established in 1968. The 2017 Nobel prize in economics has been awarded to American academic Richard Thaler of the University of Chicago for his contributions to behavioural economics. 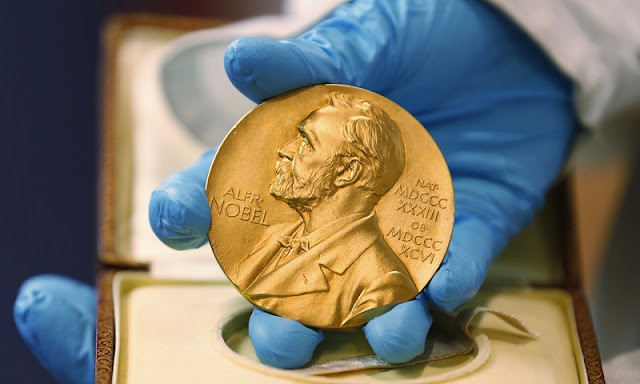 The prize, worth 9m Swedish kroner (£845,000), is not among the Nobel Foundation’s official awards for literature, peace, medicine, physics and chemistry, but was established separately by Sweden’s central bank, Sveriges Riksbank, in memory of the Swedish chemist Alfred Nobel. There have been 78 previous winners of the cash prize and medal, which has become a significant honour for economists since it was established in 1968.